Bolivian Thoughts opinion: People must continue protests, so the world can see the autocrat’s disdain to the Constitution he himself forced to us … the coca grower caudillo can no longer toy with our democracy! 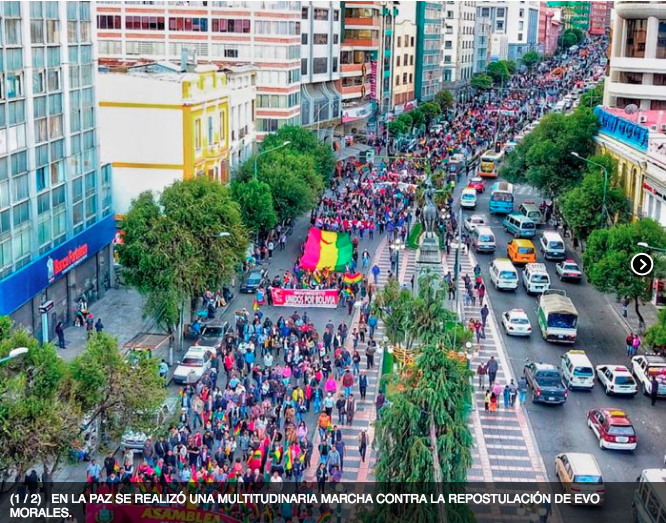 Multitudinous marches in the cities of La Paz and Santa Cruz yesterday [12/15/2017] rejected once again the ruling of the Plurinational Constitutional Court (TCP) that gives way for President Evo Morales to run for the general elections indefinitely. Mass mobilizations were also carried out in Cochabamba, and with less convocation in the cities of El Alto, Trinidad and Cobija. In the city of La Paz, photographs give an account of the magnitude of the mobilization called by the Assembly of the La Paz people and of which several organizations and institutions participated, among them the Universidad Mayor de San Andrés (UMSA). 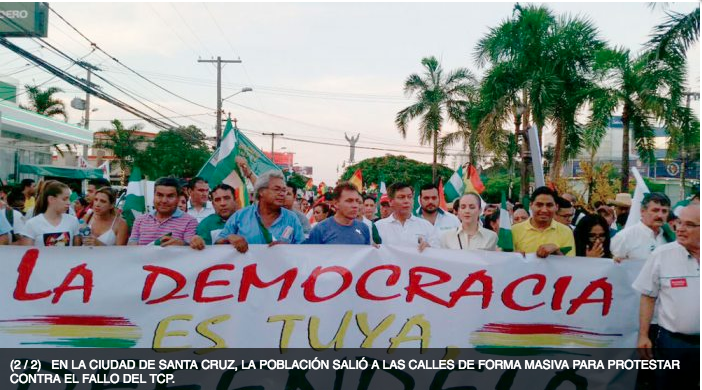 “We have come to reject the ruling of the Constitutional Court, but also to support the institutionality of La Paz,” said Mayor Luis Revilla who was at the head of the march. He added that it is one of the largest mobilizations after a long time in La Paz. He fastened “yes to democracy, not to dictatorship; yes to the legality, not to the illegality that is being allowed with our Constitution,” in reference to the prorogation intentions of President Evo Morales. The ruling of the TCP that enables Evo Morales to be a candidate violates the Political Constitution of the State that limits two consecutive terms and a re-election. The Constitutional Referendum of February 21, 2016 denies Morales the possibility of being a candidate. The massive march was also felt in Santa Cruz, where the speakers of the concentration called consecutive marches and not wait to February 21, 2018 to protest, a date proposed by the civic committee of Santa Cruz to conduct a civic strike. “Cruceños, if there is no justice for the people, there is no peace for this government,” said one of the speakers. Another said: “This is the beginning of a battle between us the just and the tyrant who wants to perpetuate himself in power,” in reference to Evo Morales. This entry was posted in Bolivia, Politics, Social Unrest and tagged bad politics, demagogue, democracy in peril, government failures. Bookmark the permalink. I am sad that I am no longer in Bolivia in these interesting times.